Well, I wrapped up the week with a solid half marathon effort. I was disappointed that my time continues to slip (especially considering the year-to-year comparison). I am on the verge of making a doctor's appointment just to make sure everything is okay. I worry about my iron / ferritin levels. While I don't feel tired, it might explain why I can't run as fast as I used to. For next weekend I am look at either the Heber Half Marathon or another 10K Night run in South Jordan on Friday night. The night run is appealing because it is close by and only $32. The Heber Half is also appealing because the race sounds very exciting (ride on the Heber Creeper Train and the photos look awesome). 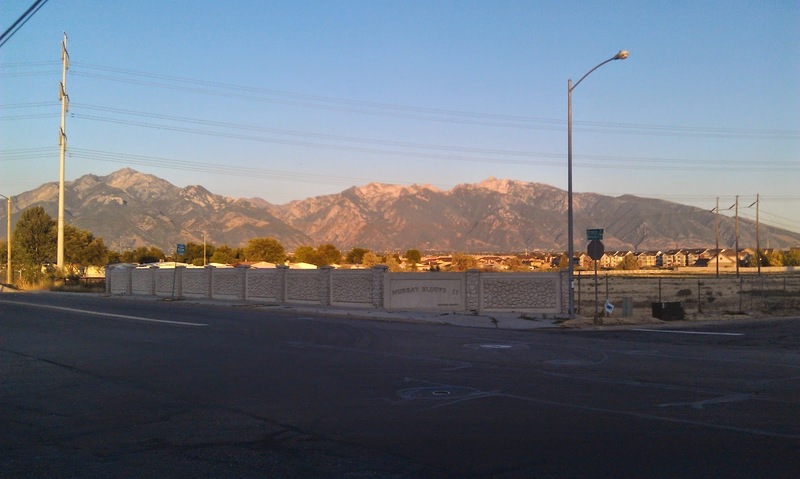 For those not familiar with Heber Utah, it is on the other side of the Wasatch Mountains and is pretty area. It would be a very early morning for me and I am not sure I have the power to go through another (semi hilly) half marathon and run it acceptably. I'll be making a decision in the next 24 hours I suppose as prices / registration freezes soon. I am still enjoying the race scene. It is nice not to be focusing on a marathon (although I suspect that will change in the next few weeks). Once the temperatures begin to drop I am hoping to boost up my mileage again. On the radar are marathons in Denver, Montana, New Mexico or a local one. We'll see how training progresses. In addition, I am still good to go with Vegas in mid-November. This week's picture was taken Saturday night as I walked home from my run. Around Winchester Park you get a good view of the Wasatch Mountains and Big and Little Cottonwood Canyons.